From a tiny town in the Victorian Alps, music has always been an important companion throughout Elena’s life. An excellent sportswoman who trained at the Victorian Institute of Sport as an elite gymnast, Elena was fortunate to attend primary and high schools with highly developed music programs, taking both flute and singing lessons. Academically inquisitive, she studied physics at University before her passion for singing could no longer be ignored. Elena then studied at the prestigious Victorian College of the Arts, completing her Bachelor of Music with Honours and Diploma of Opera before graduating from Melbourne University with a Masters of Music Performance. Elena has won numerous competitions including winning the Maria Callas Grand Prix (Oratorio-Lied)—Athens, Australian National Liederfest, Adam Didur Opera Singers’ Competition—Poland, is a multi-laureate in Jeunesse Musicales Voix, Montreal, and received prizes in the Herald Sun Aria, Gerda Lissner NY, Operalia and scholarships such as a Solti Foundation award. Elena is a Borletti-Buitoni Trust artist. Having received an ‘Acclaim Award’ to study at the Maggio Musicale Fiorentino (Florence), she undertook part of a young artist programme and performed ‘La Contessa di Folleville’ in Rossini’s Il viaggio a Reims. However, it was an exciting opportunity offered by The Australian Singing Competition, the Marten Bequest travelling scholarship and an Australian Arts Council grant, which enabled Elena to travel to London to undertake a scholarship at the Guildhall School of Music and Drama, where she was awarded her second Masters of Music with Distinction. Now in London, Elena could take up an offer of an open audition from Maria Callas Jury member and Royal Opera House casting director, Mr Peter Katona. Within 2 months of arriving in London and whilst still studying at the Guildhall, Elena was offered her first engagement for the Royal Opera, understudy in Mitridate, re di Ponto, and the further opportunity to audition for other roles. Mr Katona’s instincts for Elena’s suitability for Mozart were proven when she won the International Mozart Competition in Salzburg 2006. In that same year Elena made her Covent Garden debut under Maestro Antonio Pappano as ‘Frasquita’ in Zambello’s production of Carmen. The critics loved her performance writing—‘[Michaela] … is comprehensively outclassed by Elena Xanthoudakis’s brilliant Frasquita’ (Independent on Sunday). Elena returned the following year to sing ‘Clorinda’ in La Cenerentola—‘… Cinderella is outshone by the ugly sisters’ (The Observer), and returned to perform Frasquita that season and appeared in subsequent seasons. The English National Opera were also very supportive of her talents and she debuted as ‘Krista’ in The Makropulos Case with Sir Charles Mackerras. She also performed with chief conductor Edward Gardner in Carmen and created the role of ‘Miss Schlesen’ in their acclaimed production of Satyagraha. Elena also studied as part of the ENO Young Artist Program and has sung ‘Pamina’ in the Nicholas Hytner’s production of Mozart’s Magic Flute with resounding acclaim. ‘Especially memorable is Elena Xanthoudakis’s Pamina, voiced with shining tone and a fine appreciation of the music’s lyrical contours’ (The Guardian). Elena has sung for many British companies including, ‘Blonde’ in The Abduction from the Seraglio for Opera North—‘Robustly comic, Elena Xanthoudakis has the athletic style to conquer the dizzying heights required of Blonde.’ (The Independent), and L’elisir d’amore for Scottish Opera ‘Soprano Elena Xanthoudakis is a sheer delight as Adina, colouring every sung moment with refreshing clarity and agility or, where called for, plaintive reflection.’ (The Scotsman). Elena’s operatic repertoire ranges from Mozart and Rossini to Janáček and Glass. 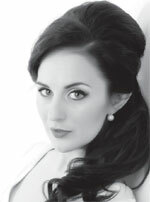 She has performed with many celebrated opera companies. Elena has sung in concert with such orchestras as Scottish Chamber Orchestra, Royal Scottish National Orchestra, Melbourne Symphony Orchestra, Orchestra Victoria, Sydney Philharmonia Orchestra, Tasmanian Symphony Orchestra, St Petersburg Camerata, Orchestra de Quebec, Royal Philharmonic Orchestra, Krakow and Poznan Filharmonia Orchestras, Mozarteum Orchestra, BBC Concert Orchestra, Orchestra of the Age of the Enlightenment and Accademia di Santa Cecilia, Roma. In concert and recital, Elena has performed in Japan, Hong-Kong, St Petersburg, Montreal, and Quebec-City, in Germany, the U.S and throughout Australia, the UK, Ireland, and Italy in repertoire ranging from Bach’s B Minor Mass to Strauss’ Vier Letzte Lieder.